Ballantine Books. Used - Good. Good condition. Stamped on inside & page edges. Ballantine Books. Used - Acceptable. Acceptable condition. Slightly dampstained. Softcover. 160 pp. Ballantine Books, New York (1968). First Edition. Fourth Printing stated. (June, 1972). "Ballantine's Illustrated History of World War II; Battle Book, No. 4". Original $1 price on cover. 01844 in the paperback series. Clean, bright, and unmarked inside and out. Minimal edgewear. Light reader's creases to spine. Very Fine to Near New. More photos on request. Shipped in a box within a box, in bubble wrap, with a tracking number. WPG Uitgevers Belgi? - Algemeen & Import. Used - Very Good. Ships from the UK. Former Library book. Great condition for a used book! Minimal wear. 100% Money Back Guarantee. Your purchase also supports literacy charities. London: Macdonald & Co.. Very Good. 1968. Softcover. 160 pp. Illus. Edgewear, corners rubbed. Purnell's History of the Second World War Battle Book, No. 4 An account of the bitter fighting that stopped Hitler's last gasp assault in the west. .
New York: Ballantine Books. Very Good. 1969. Second Printing. Softcover. 160 pp. Illus. Edgewear, corners rubbed. Ballantine's Illustrated History of the Second World War Battle Book, No. 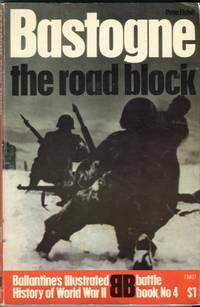 4 An account of the bitter fighting that stopped Hitler's last gasp assault in the west. .
NY: Ballantine Books, 1969. pp., 160, illustrated throughout with black & white illustrations from photographs, 1 pp bibliography, light shelf wear , else very good, A volume in Ballantine's Illustrated History of World War 11, Battle Book No.4 . Second Printing,. Paperbound. Very Good. 8 Vo.,. London, England: Macdonald & Co. Publishers Ltd, 1968. Softcover, reprint, 232gms, 160 pages. Another instalment in Purnell's History of the Second World War. This is book number 4 in the battle set. Book is in good condition with general age-related wear and tear and light page discolouration. Cover shows some creasing and scufiing and spine shows light fading, otherwise no other pre-loved markings. . Reprint. Softcover. Good/Not Applicable. 12mo - over 6¾" - 7¾" tall. New York: Ballantine, 1968. Book. Near Fine. Soft cover. 1st American Edition. Unread trade paperback, photo red/black covers, minor edgewear. Tight. With many b/w photos. "Battle Book No.4." No names, clean text. 218 shelf.